Ship: While the AmaDolce holds 148 guests we only had about 85 people on this sailing. The ship is laid out very conveniently with the lounge on the same deck as the lobby and the dining room one deck down. Cabins on Deck 2 are a convenient ½ deck away from either! Deck 3 cabins have direct access to the aft lounge where several functions were held for the onboard groups. The ship was decorated tastefully in reds and oranges with dark woods throughout. In the spirit of the season, they had a large Christmas tree with garland and other décor festooning the ship. It was very nice! The small gift shop spilled out into the lobby, sometimes making it seem a little like a flea market, but they have very little space to work with. featured “local” regional dishes on the menu as well. Frequently, after the main course was served, the waiters would bring out additional vegetables and serve them to you if you’d like. Summary: This was our 3rd river cruise and our 45th cruise overall but our 1st cruise on AMA. AMA offers an exceptional product that our clients will be extremely satisfied with. We found many of our fellow guests to be first time river cruisers and only three people had been on an AMA cruise previously (besides the group leader and staff with one of the groups). The Christmas Time Market cruise is a good choice to get people interested in river cruising, and they will want to go back and see these cities in the summer when it’s warm! 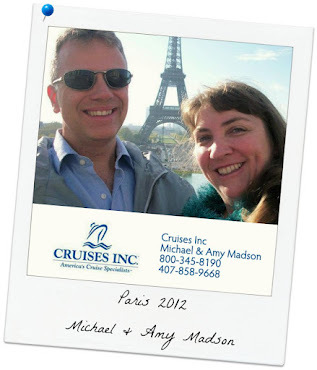 We have our 4th river cruise booked for April 2012 – Paris to Normandy Beaches on Avalon Creativity. Want to join us? ?